I ain't no hair stylist, not even a little bit. 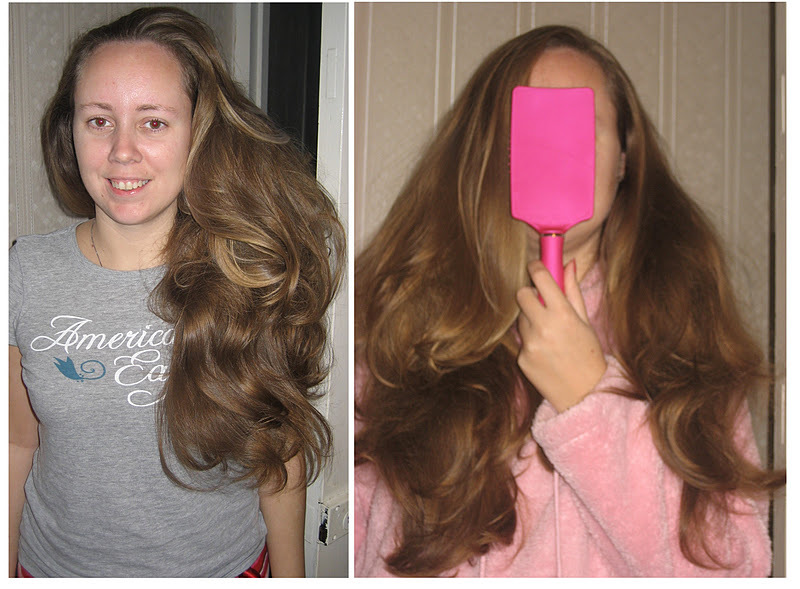 This explains why I love my Babyliss Big Hair Styler so much. It makes me look like I have a clue (even though I don't) and so when it comes to actually styling my hair, the easier the better (for everyone). I saw a picture of Eva Longoria recently and immediately thought "hmm, I could totally do that on Joanne's hair". Her hair is down to her bum and also finds it hard to do much with it that doesn't involve straightening it or putting it in a pony tail. This was our inspiration and what we were trying to achieve. First up, the equipment. You'll need some bobby pins, we got ours in Penneys for €1.50, grand price altogether. 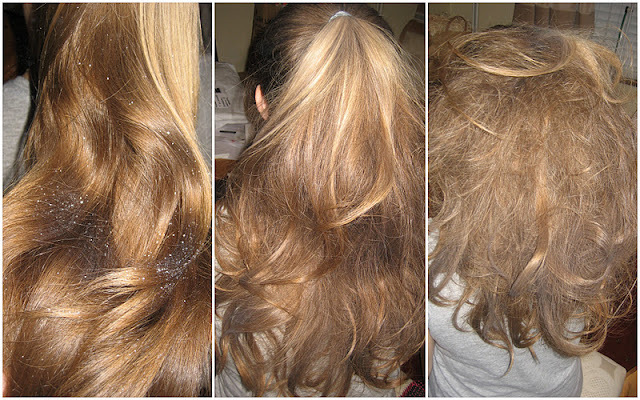 We used Ojon's Volumizing Styling Spray (€24) that was sent to us to try and Lakme's matt powder (€7.95) that I was given by Adele in Hair Crazy to play with. 1. I pulled Joanne's hair back into a high pony tail, keeping it as smooth as possible. As sisters, the law was on my side and I was able to pull extra tight, just for the craic. Right: Joanne's hair au natural. Left: High pony tail. 2. I got the matt powder or as I like to call it, dust (dust? anyone? no? dust?) and sprinkled lots of it it into the length of her hair and began to backcomb, creating a big massive hairball on her head. I could have been the evil older sister and left her like that (and chances are if I wasn't doing it for this blog post, I'd have left her like that for about an hour for more the craic). 3. Next comes the really fiddley bit. You're going for the bird's nest look. So you need to sweep the hair around the base of the pony tail, securing it with some bobby pins. Easier said than done because her hair was a massive ball of fluff and the matt powder made it go a bit sticky but it's that texture that makes the hair stay put and not fall, so we got stuck in. Literally. 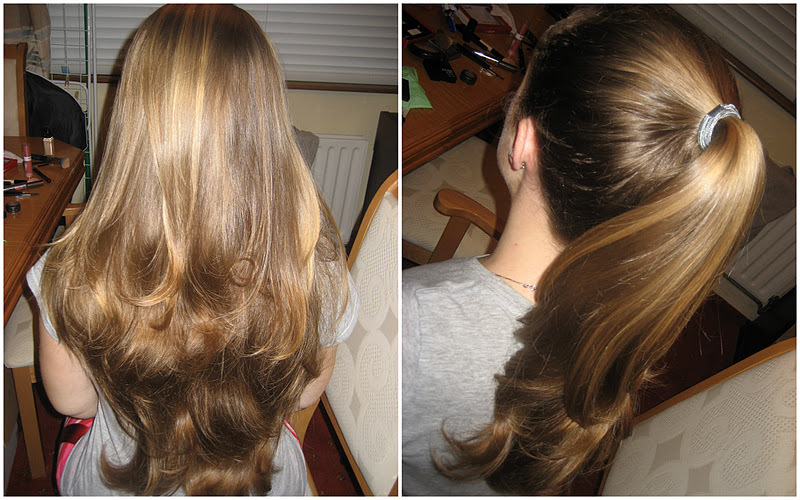 Joanne's hair is really long as you know, so it took about ten minutes to get it looking halfway decent. 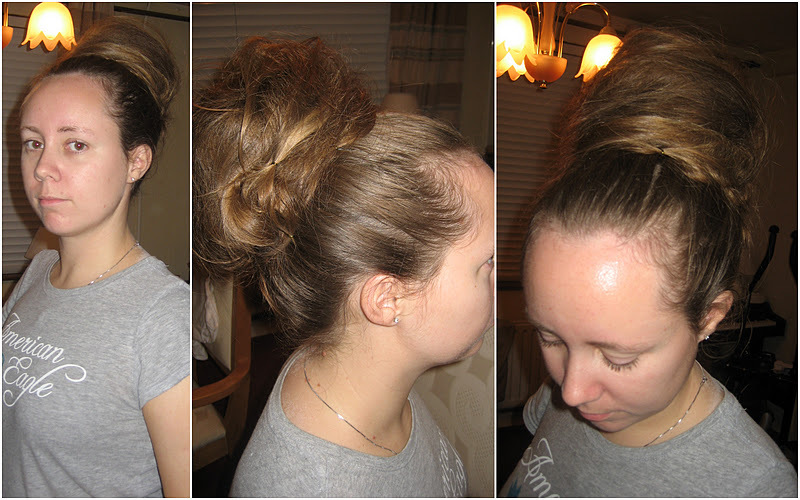 So this is what we ended up with folks; a simple messy bun that anyone can do. You can obviously make this as neat or as unkempt as you like. I think it all depends on how much time you have when you're getting ready! 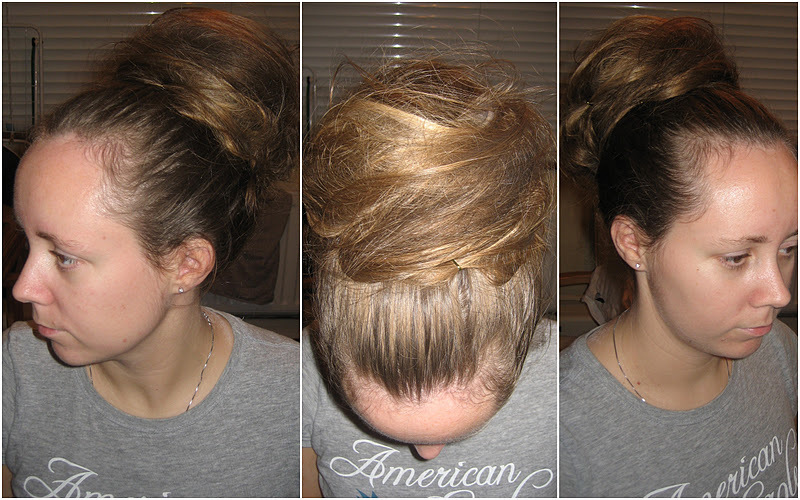 So folks, do you think you'd be able to give the messy bun a go? It really is easy peasy lemon squeezy! My love affair with Origins continues ladies. A few weeks ago I found myself wanting to buy a night cream and it didn't take much time for me to decide to go back to a tried and tested night cream. Origins Night-A-Mins was that cream. I have an oily t-zone and normal cheeks for the record but in the winter my cheeks get dry patches, very annoying altogether. A few years ago I made my way through two bottles of the stuff. This was back in the day when it came in glass bottles like this and it was runny. It promised me strong skin while I slept and sure who wouldn't want that eh? Gone are the glass bottles and now Origins has High-Potency Night-A-Mins mineral-enriched renewal cream in a dinky plastic tub, although they kept the same colour packaging, which I like. €42 got me a 50ml tub of cream and I was happy to hand the spondoolies over because I knew my skin was in for a treat. Origins says: "Formulated with extra vitamins, extra minerals and a gentle exfoliating extract. Helps skin repair while you sleep to reveal a brighter, more youthful texture and tone." I say: Oh I love this stuff so I do. 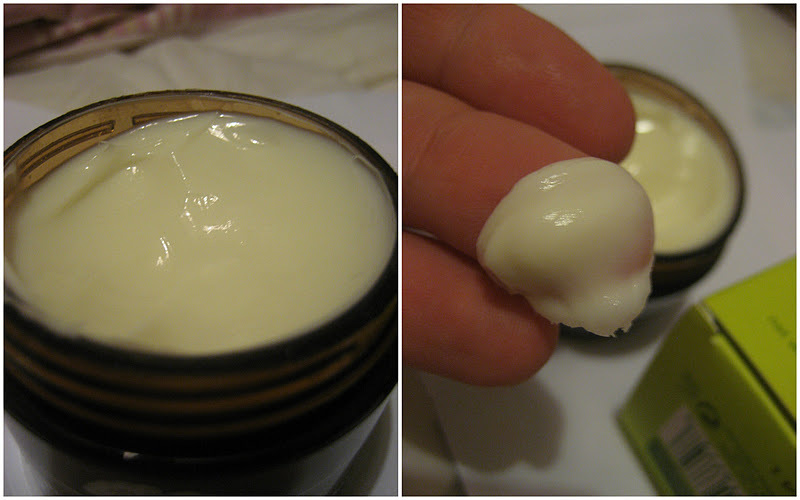 It's a rich, thick cream that I thought was going to be really heavy on my face but my fears were unfounded. I usually scoop a bit out and rub it between my fingers to warm it up and disperse it evenly, then apply it all over my face. I absolutely love the scent; kind of orangey, apricoty, light and fresh. It's relaxing and comforting and helps me settle down to go to sleep thanks to the essential oils. I like to apply it and then let it sink in as I read or mess around on the laptop. It leaves my face feeling so smooth and soft and like I've given it a treatment. When I wake up in the morning, my skin still feels amazingly soft. Despite the richness of the cream, there's no clogging of my pores, no breaking out, just smooth, bright, hydrated skin that feels well looked after. It comes in an oil-free version too but I don't usually like oil-free moisturisers so I played it safe and bought the regular one. When it comes to night creams, I want something that has has some oomph to it, I want it to be heavier than my daily moisturiser, I mean, it's going to be sitting on it's own on my skin so I want it to pack a punch on my skin for those hours and ladies, this cream does not disappoint me at all. I made it my mission to start taking care of my skin properly after not bothering for so long. Origins High-Potency Night-A-Mins has made it back into my skin care regime after a couple of years hiatus and it's here to stay. Well worth the money in my opinion. Have you tried any Origins products? What do I need to try next? When you open the box, it's prettily packaged with black tissue paper and a cute red ribbon along with the card that tells you about the products inside. Let's look inside and see what we get for our spondoolies shall we? From left to right we have New Cid's i-Pout lipstick, which is a lipstick complete with a built-in mirror (which took me ages to find because I'm an idiot - it's on the side folks) and has a little button on the bottom that lights up two little LED lights. Cute! Neom Organics is next with a Real Luxury Organic Body Lotion. I've never heard of Neom so must do some research on them, but of course when I see the name, I pretend I'm at the Indy 500 and say "neommmm" like I'm watching cars go by, yep, weirdo, I know. This smells gorgeous and can't wait to have a go. Thirdly we have Brow Ink from Cosmetics A La Carte. I was really excited to see this and have been on the lookout for one of these ever since I saw Lisa Eldridge using one similar to it in a video a while back. I won't go into this in detail because I shall be reviewing it soon but I had a little go this evening and was so impressed with it. It's basically a very fine tipped ink pen that lets you draw individual hairs on your brows. Love. Second last is Dainty Doll's Eyeliner Pencil. Nicola Roberts has her own make up range out if you didn't already know this and in the beauty box, we get a full size eyeliner! My one is in the shade Shake Your Tail Feather and is a metallic green, can't wait to play more with this. Finally is Lulu's Time Bomb Flashback Night Cream in Rewind Time (yeah did you know Lulu had a skin care range? No, me neither). I'll give it a go though. The little card that comes with the box has discount codes for each of the products with is a fantastic idea! So if you decide you want to buy the full size product, you still get to save a few bob. We like that. So onto the details. The service costs £10.00 with postage being £2.75 which works out at just under €15.00. You can either go for a monthly subscription which you can cancel any time, a six month subscription that you pay for up front and can't cancel until the end of the six months, or a 12 month subscription where you pay for 11 months up front and get the last month free. You get the box delivered by the 10th of month. For a beauty blogger, trying and buying so many different beauty products can be expensive especially if they don't work for your skin or you just don't like them. Beauty boxes like these and the other ones out there are good for bloggers because we get to try products that we've never heard of (like Lulu) and we can discover some great new brands without the expense of buying full size items. For the non bloggers out there, boxes like these are a nice present to give yourself or to a friend if you're feeling very nice! I like the idea of getting to try five new products every month but I think they could make the packaging a bit smaller and maybe save a little bit of money that way. It would be great to have the option to choose having it come in a pretty box like this, especially if you were giving it as a gift. They're going to have the option to create a beauty profile so that you'll be able to tailor your future beauty boxes which I love because it means no products will go to waste. What do we think ladies, does Carmine's Beauty Box tick any of your boxes? 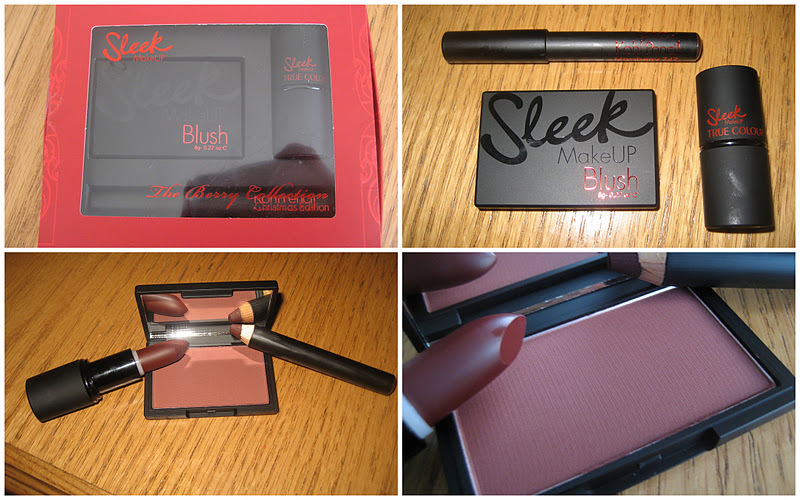 When I caught wind on the interweb that Sleek Make Up were bringing out a set for Christmas, I was intrigued. But I saw photos of the products, I knew I needed to have them, so promptly picked it up in Belfast on Saturday for the grand price of £9.99 in Superdrug! The Berry Collection has a matte lipstick in the shade Cranberry, a blush in the shade Fenberry and a kohl pencil in Mossberry. They're all gorgeously rich and pigmented and are perfect for the winter season. They're vampy but still wearable and I couldn't wait to play with them! I don't really use matte lipsticks because they can feel really dry on my lips and I like the feeling of product when I smush my lips together. 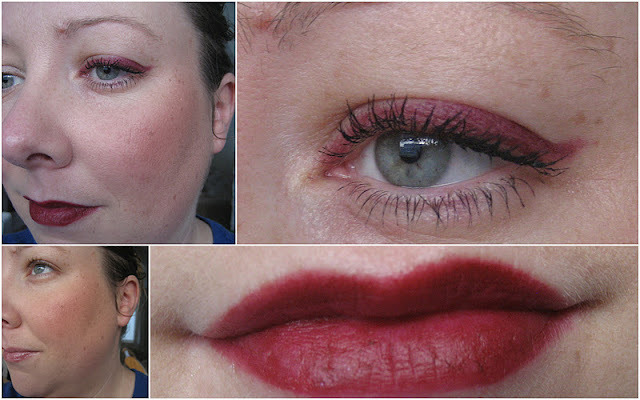 Cranberry has some slip in it, making it not 100% matte and so I am happy with that. Looking at the lipstick in the bullet, I thought it was going to be a browny red and didn't think it would work on me. A quick swatch on my hand showed that it's a rich, well, berry colour with red undertones. It can be worn dabbed onto the lips as almost a stain and patted in with your finger, or for the daring ones, as a full on vampy berry lip. 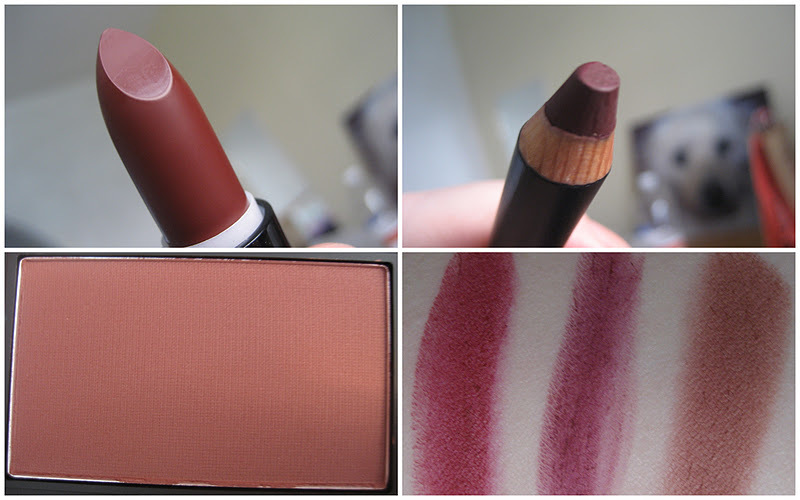 At first I thought the kohl pencil (Mossberry) was a lip pencil, especially when I swatched it. It has purple undertones to it and after I double checked online and saw it was an eye pencil, I got going with it on my eyelid. I think I'll use it for both my eyes and lips though, it would work on either either. It's a dry pencil so I had to warm it on the back of my hand first before applying it to my upper lash line as you'll see below. I couldn't find my pencil sharpener so wasn't able to do a really precise line, I wish Sleek would have sharpened it to a point from the get go! When I saw the blush (Fenberry), I got a bit scared. I thought it was going to be really dark on my skin. The swatch below on my arm shows what it's like unblended. It's a rosey brown cheek colour that was really hard to photograph on my cheeks for some reason! It looked pigmented in person but it wouldn't translate in the photo, maybe it was the lighting. Swatches L-R: Cranberry lipstick, Mossberry kohl pencil, Fenberry blush. So what do they look like on the skin I hear you say? Here are some photos of the Berry Collection on my visage. I felt a bit lonely being the only non-berry in the group, so for this post, I am calling myself Halle Berry. The blush is one of those shades that can be used either on the cheekbones as a flush of colour, or as a contour colour to give you those all important sculpted cheekbones. It's pretty pigmented so just be careful when you're getting stuck into it with your brush, start off light and build as you need to. I think the kohl liner will be fabulous blended it all over the eyelid with some black liner on the upper lash line and waterline. It makes my eye look really green and because of the purple undertones in it, it doesn't make moi look like I've been crying which is always a good thing. My poor lips are in bits at the moment and so I'm on Operation Mind My Lips. So word of warning with the lipstick; make sure you prime your lips with plenty of lip balm before using it. This is one of those shades that could be used on the cheeks too if you wanted and as a light stain, regular lip colour and topped with gloss for a full blown va-va-voom lip. Check out Lisa Eldridge's video here if you're not sure where I'm going with this. The photo on the top left here shows all three products on the face. It might be a little much to wear them all at the same time but sure it's only make up! So will you be picking this up for your good selves ladies? Tis the season to do some self gifting and all! 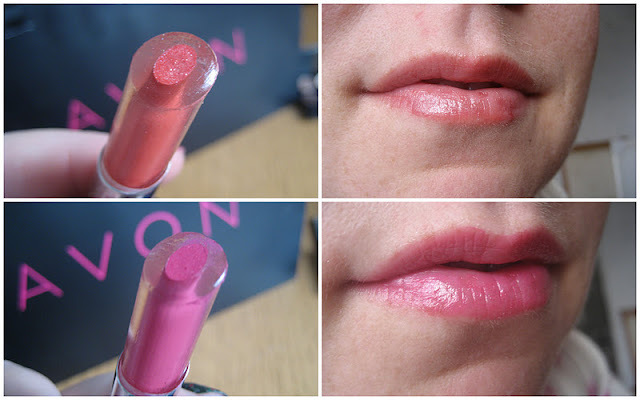 A couple of weeks ago I went to see what new products New York Colour had in store for us and was excited to get to play with the Blushable Creme Sticks. All I can say ladies is these are so worth the €3.49! I've been wearing this one, Big Apple Blush, every day to work for the last three weeks and I can't see myself stopping any time soon. I am a messy person and like to apply this with my MAC 109. The reason being is when I use my fingers to apply products, I forget to wipe my hands and I inevitably get them all over my clothes before I've left for work, so this is my fool proof way to stay clean (until break time, then all bets are off, spilling things a plenty). I either dab my brush onto the top of the product and work it into the skin, or apply a big strip on the back of my hand and dip the brush into that and then work it on to my cheeks. The blush is contained in a tube that you twist up to reveal the product. It blends like a dream and is buildable, giving both a flush of colour to the cheeks and a beautiful sheen. I'm all about glowy cheeks these days and if that's what you like, then these are the products for you. 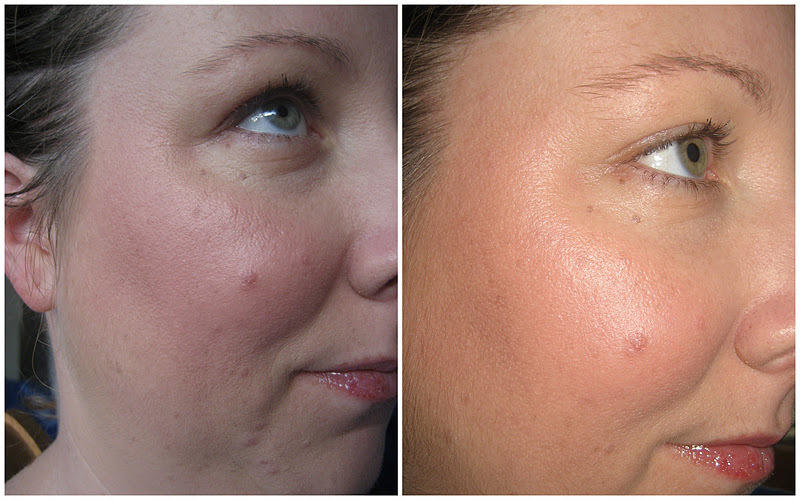 Below is a comparison photo showing the Blushable Cream Stick on one cheek and nothing on the other cheek. 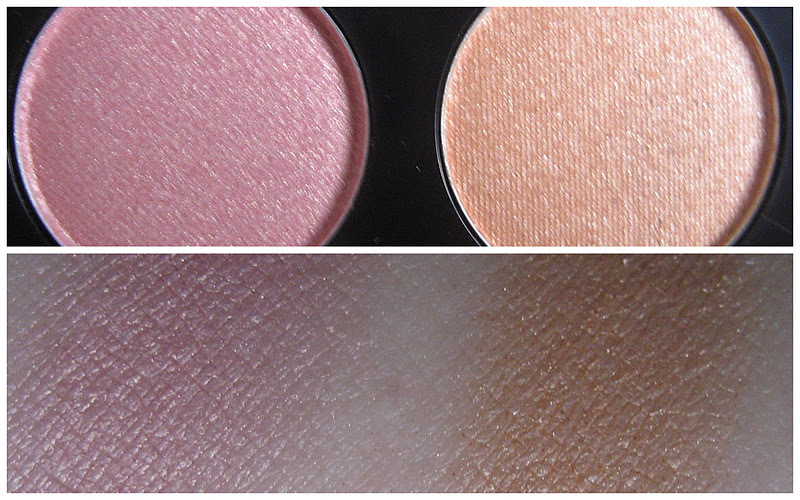 Left: NYC Blushable Creme Stick in Big Apply Blush Right: Nothing on cheeks. Below is a photo of the Blushable Cream Stick in natural light and taken with the flash on to show you the glow it gives. I love these little sticks and can't wait for more shades to be released here. They last about six hours on me and that's without setting them with any powder. I usually set my foundation with powder but just on my t-zone, leaving my cheeks to glow away. If you wanted them to stay put for the day, then I'd set them with a powder blush and they won't go anywhere. What do you think girls? Cheap as chips and gorgeous, that's my boxes ticked! To see where your nearest NYC stockist is, text NYC to 51500 for the cost of a standard text message. 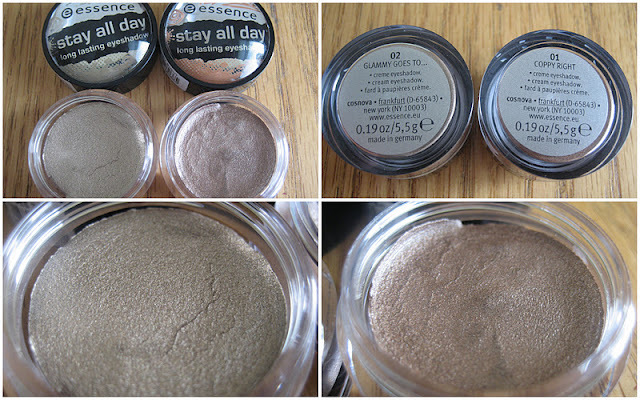 Last week I picked these pots of shimmery goodness in my local chemist for €3.49 each. New from Essence is their Stay All Day long lasting eye shadows that comes in six shades. I got the shades Glammy Goes To and Coppy Right and had to forcibly remove myself away from the stand with one eye looking longingly at the other shades and the other eye quickly scanning everything else in the chemist while I walked in slow motion to the checkout. The packaging is plastic with a domed lid, cute and functional. Inside is the densely packed eye shadow and these creamy metallic shades are right smack bang in my comfort zone for every day wear. 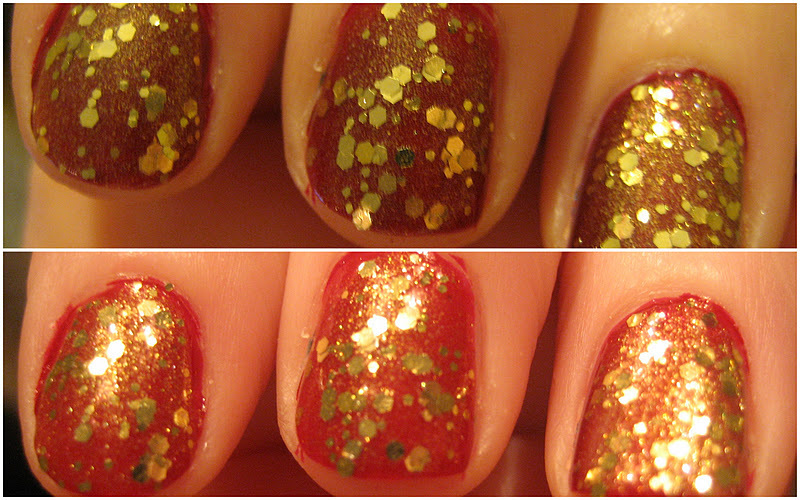 First up is Coppy Right, a warm copper shade. This has a mixture of gold, bronze and brown that is really pigmented when applied thickly but becomes really sheer when blended out. It's more sheer than Glammy Goes To and I think it would be a good introduction to creamy shadows novices. Out of the two shades, this one would suit more skin tones. Next up is Glammy Goes To. I love me some champagne eye shadows and was excited to give this a go. I've worn this cool toned shade a couple of times this week and it made me look bright eyed and bushy tailed. It's a pretty, every day staple for a couple of euro. These shadows are billed at being non creasing, but when I applied Glammy Goes To without a base, it did crease after about four hours. Now, I do have oily lids and have to wear a base every time I wear eye shadow because most products crease on me, especially when it's roasting in the office and I have no idea how to turn the heating down. On the second day of wearing Glammy Goes To, I applied a base that I'll talk about more in an upcoming post. The shadow only started creasing after 9 hours and I can't ask any more than that folks. I like to apply them in one of two ways. I either get my ring finger, swirl it about in the product and pat it all over my lid to achieve the level of coverage I want. I then use a clean finger to blend away the harsh edges. My second way to apply them is to get a fluffy brush like a MAC 217 and have at it. Doing it this way means you can build the colour gradually and not go over the top. 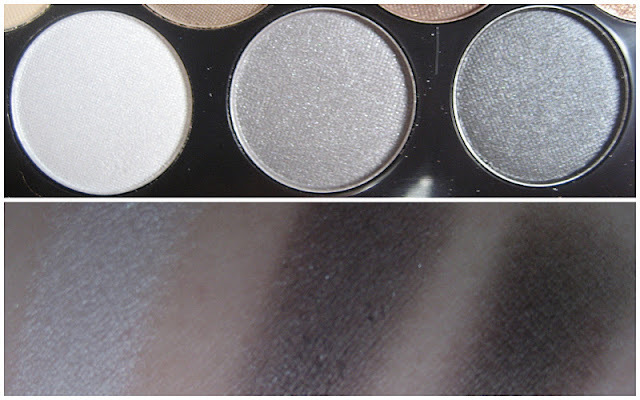 I've been looking at swatches of Rock Chic online and think I need it too. Essence have so many great products for fantastic prices that it makes being a beauty lover great fun. We get to be able to try some great quality products for a few euro and you can't ask for anything more lads! I'm a huge Essence fan and they've given me inspiration for a great many posts. Click here to read through them! Do you have any Essence recommendations folks? Welcome to our first post in the series we like to Creme de la Paw where we'll be reviewing our vast collection of hand creams that are meant to moisturise, soothe and basically love your paws so that they're in tip top shape for the winter season. Nobody wants to be showing off their Christmas manicures like this one and even this one with big old grandmaw hands, so we're here to give you our heads up on what hand creams we love. First up is the latest addition to our collection and the very season appropriate Spiced Vanilla hand cream from The Body Shop. I got this when I went along to the Christmas event at The Body Shop a few weeks ago. I think it's €8.50 but will double check and let you know. This is a 50 ml tube of loveliness and is a handbag friendly size. The cream itself is really thick when you squirt some onto your hands but sinks into the skin easily and without frantic rubbing of the hands or having to wait for ages for it to sink in. There's no greasy residue left either, just a sheen on the hands. The scent though is my favourite thing about this hand cream. It's described as Spiced Vanilla and at first I was afraid it would be too cinnamonny or clovey but no, it's completely lush and just the most warm and cozy scented vanilla hand cream that is so comforting and makes me smile every time I use it, without fail. It's actually a bit weird that it makes me do that but sure there's no harm in smiling a little bit more these days. It's on my desk at work now and I make my chums try it when they come visit and they love it. It also comes in a smaller size as part of this here set of hand creams with the other two Christmas scents, Candied Ginger and Cranberry Joy for €17.50. Now, The Body Shop Ireland are having a one off 30% off everything one day sale tomorrow so get shopping if you see anything you like! 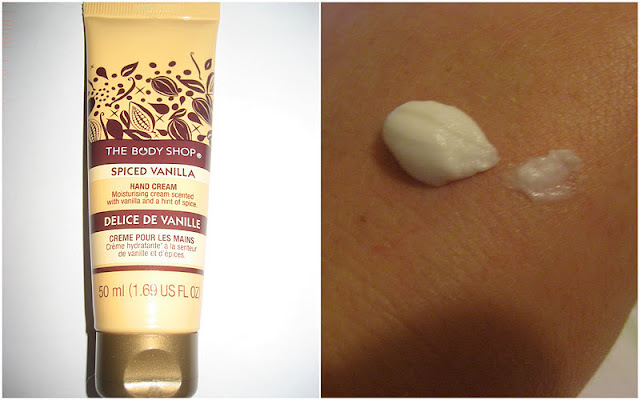 I've reviewed and talked about some of The Body Shop's products so have a look below to read before you buy. So the Spiced Vanilla hand cream gets my thumbs up and is a mighty start to our Creme de la Paw series. Do tell, what's your favourite hand cream? A couple of weeks ago I met Jackie Tyson, celebrity spokesperson for Avon who was in Dublin to talk to us about Avon's latest offerings. 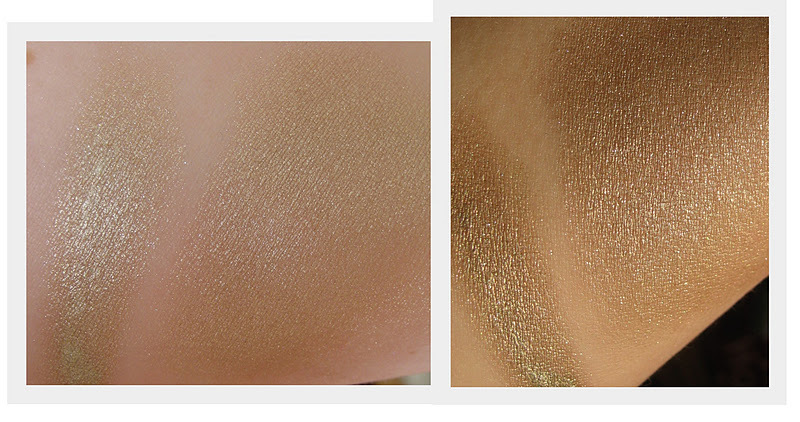 You can read about their Ideal Flawless Liquid Foundation here if you should be so inclined. 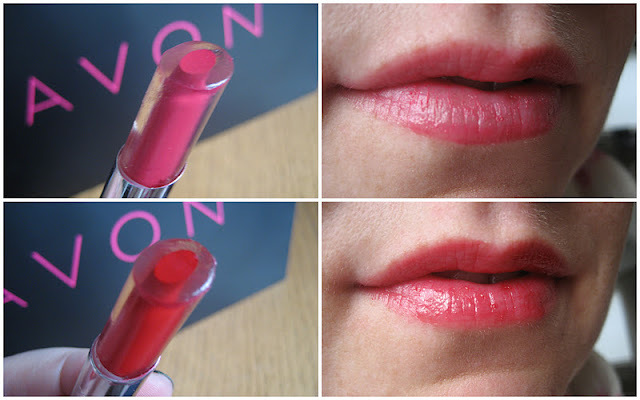 This post is dedicated to Avon's Shine Attract Lipstick. Take a look at this Kryptonite-esque display of said lipsticks. The core of the lipstick is the pigmented part and is enveloped by a clear moisturising gel that's infused with Vitamin E. Now, as I mentioned to you recently, I am afraid of brightly coloured lipsticks and am happy to gloss my lips to beat the band. These little bullets of beauty, however, have given me confidence because they're a great way to ease my way into wearing brighter colours. See, I have really dry lips, especially in the winter, so the moisturising gel is exactly what I need. But enough of my jibber jabber. Here are swatches of six of the ten shades that will be released in February for €11. Avon always have offers on though, so keep an eye out. 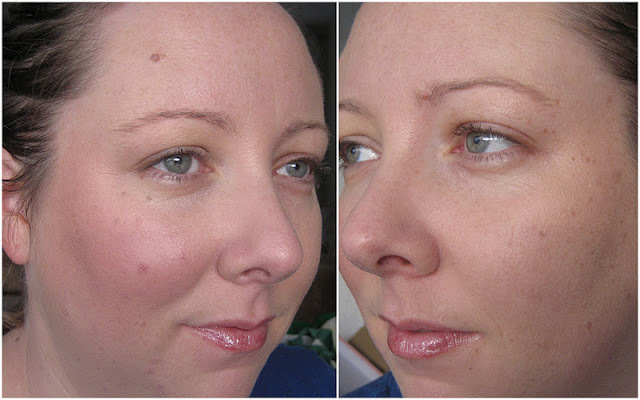 They go on really smoothly and can be as sheer or as pigmented as you'd like. 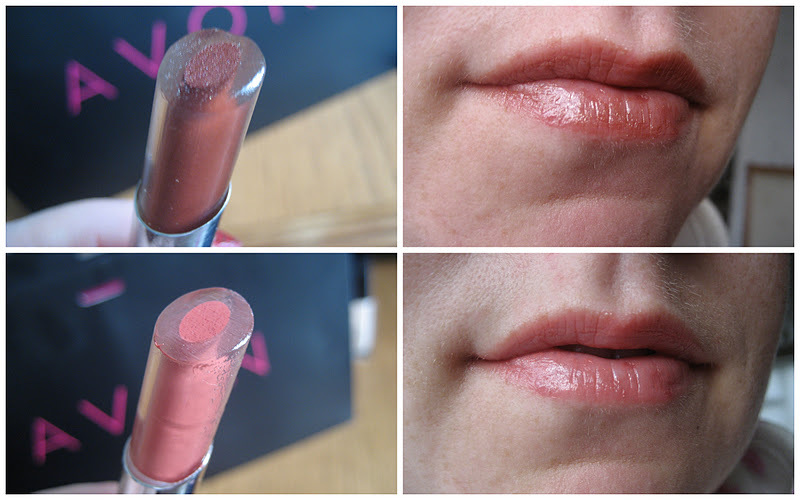 Jackie suggested to use a lip brush and dip into the pigmented core itself if you wanted a more opaque lip. I, however, am not ready to do that yet. I can sit at my desk at work and slather this all over my lips and not worry if it's uneven or not. And if you're worried about getting to the edge of your lips, just rub the lipstick with the core part over the edges of your lips, it's that easy. This is meant to be carefree and natural. 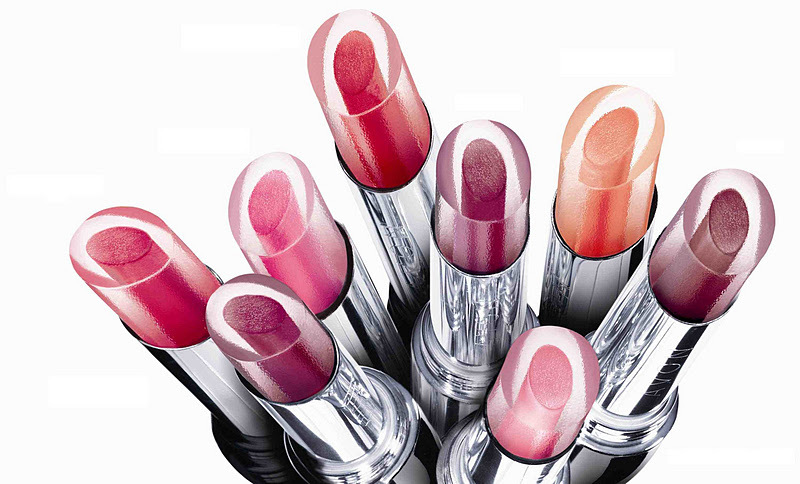 If you want something neater or precise, then use a regular lipstick. I find it hard to accurately tell how long a lip product lasts because I'm always swigging water at work, biting my lips, touching my lips etc. When I start to feel any lip product wearing off, I lash more on and it's easier to tell that this has happened with glosses and glossy lippies like these ones. I would feel very comfortable applying the brighter ones after a couple of drinks, safe in the knowledge that they would look gorgeous and I wouldn't have made a mess of myself. I'm heading to a party next weekend and will bring them with me to see how I get on! So whadaya think of these? Have they tickled your proverbial pickle? You're going to a Christmas party and you want something quick and easy to plonk on your nails. It's an added bonus if it's gorgeous too and the fact that this manicure is cheap as chips just adds the star to your Christmas tree! Take any red nail polish and lash a couple of coats on. If you don't have a red nail polish in your collection then I don't know what we'll do with you. Go get one now. 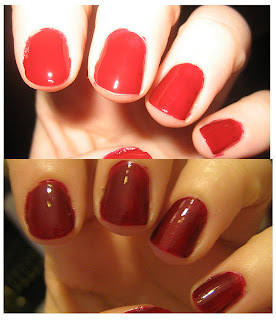 I'm using Red Zin from Sally Hansen which is a gorgeous deep red polish, perfect for the Christmas season. 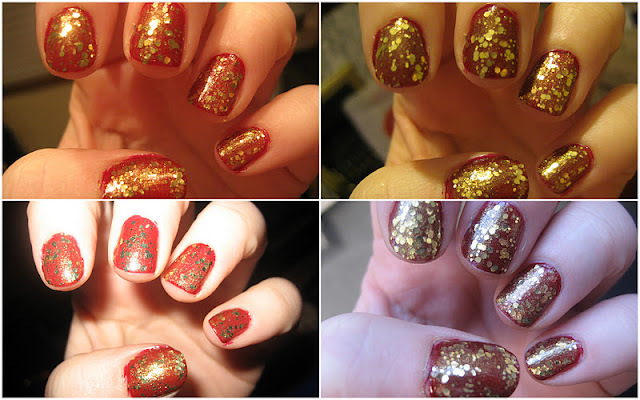 Take Essence's Make it golden which is €1.29 and put a couple of layers on and you have beautified Christmas nails that anyone can do. It's that easy! Make it Golden gives a lovely sheer layer of fine shimmer and then bedazzles the living daylights out of your nails with the hexagonal glitters. You can also layer it which is sometimes necessary. Like when you've just done a layer, the doorbell rings, your lunatic of a dog goes mental and tries to eat the flap of the letterbox, you pick up said lunatic dog so you can answer the door, nail polish smudges, you curse the man at the door (not to his face, that would be rude, he's only coming to collect the Betterware magazine) and the lunatic dog, you are not going to start again, no, you apply another layer and go on your merry way. I love these Essence polishes and they never fail to get people commenting, asking me if I did it myself; put each hexagonal glitter on one at a time. Am definitely going to tell someone that I did next time they ask! I will fully admit that I always thought mineral make up was the loose powder stuff and have tried it in the past and found that I'm not a fan of mineral make up, or what I thought was mineral make up. When I read about The Body Shop's Extra Virgin Minerals foundation, I gave a little "ooh, muy interesante". Not only do they have the powder foundation, but there's also a cream compact and liquid foundation. This was new to me and couldn't wait to give the cream or liquid a go. At The Body Shop's Christmas with Karim event back in October, he talked us through the three products and explained that instead of formulating foundations based on skin type, The Body Shop have formulated them based on the finish you want. The liquid foundation (€22.95) gives a fresh, dewy finish, the cream compact foundation (€24.95) gives a matte finish and the loose powder (€23.95) gives a natural, radiant finish. The range contains Community Fair Trade pure cold-pressed olive oil and ultra fine mineral pigments giving both moisture and buildable coverage and are available in seven shades. When I went to The Body Shop to get my first ever facial, I was given a chance to pick one of the foundations. I decided to play it safe and give the liquid foundation a go. I was colour matched by Eleanor, their gorgeous make up artist who chose shade 105 for me. (Let the record show that she picked the exact right shade for me, not too dark or too light, she was the Goldilocks of make up artists). The foundation itself is a runny liquid and I can get the scent of what I think is the olive oil when I first apply it but it dissipates quickly enough. I use my Sigma F80 as usual to apply and it blends into my skin like a dream giving my skin the most gorgeous glow. A little goes a long way with the liquid foundation. A full pump is too much for my face and ends up feeling heavy on my skin, so around half a pump does the job and gives me the coverage I want. 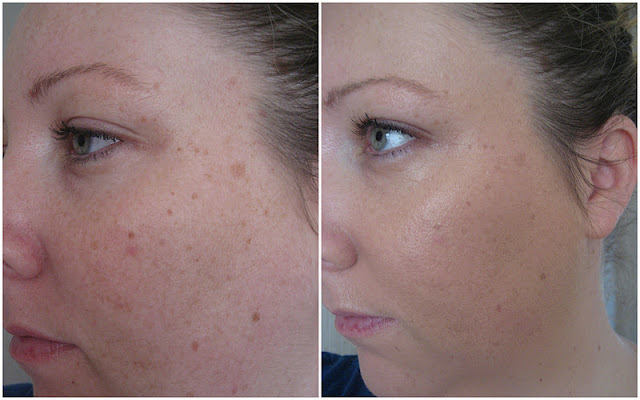 As you can see in the before and after photo below, it gives me medium coverage which I love. It's nice to be able to see your skin showing through and not look like you've a big old mask on. I find it's necessary for me to powder my T-zone with this and I think it's because of the olive oil in it; it does moisturise my skin but my oily T-zone doesn't need too much of that. 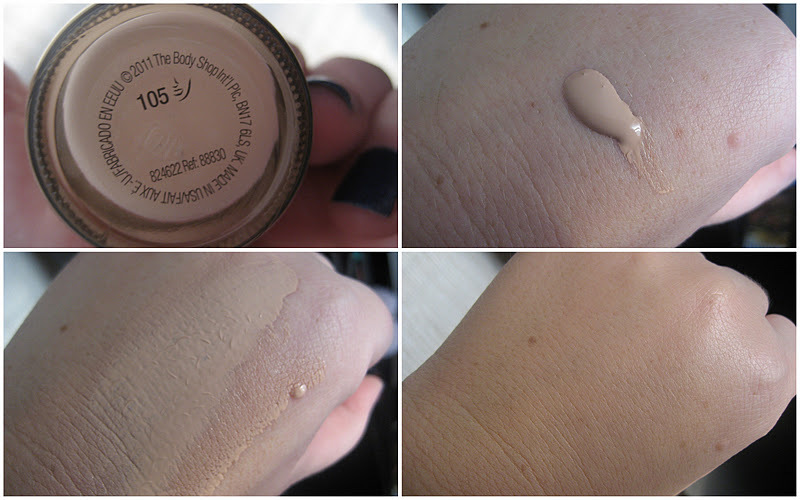 This has been my favourite foundation hands down over the last couple of months. I have used it pretty much every day and it hasn't broken me out. It has an SPF 20 in it which is great because I'm so lazy and don't use a separate one. The cream compact has an SPF 15 and the loose powder has SPF 25 in case you were wondering. I'm so happy with this foundation and I am considering trying the loose powder as a setting powder rather than a foundation after seeing Karim using it in October. Mineral powder just isn't for me as a foundation but mineral liquid foundation is! Yesterday I was in town with the mothership and found myself in A Wear. Of course, I was magnetically drawn to the Gosh make up stand. Nothing I could do about it. It was like I had hovercraft shoes really. 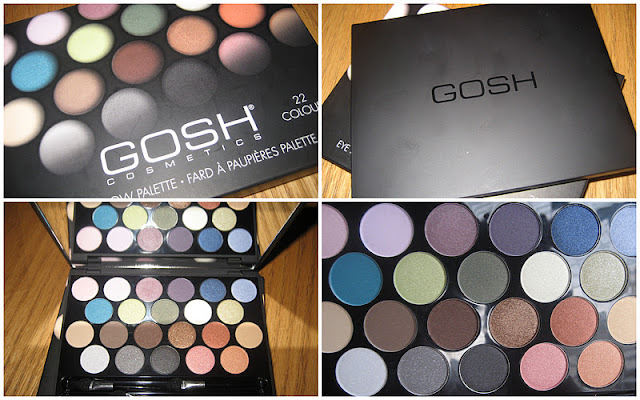 I caught sight of this fabulous eye shadow palette that I saw on beaut.ie earlier in the week and there was only one left. Obviously, this meant one of two things; they sold like hotcakes and must be amazing so that's why there was only one left. Secondly and most importantly is that because they were all sold except for the last one, it was obviously meant for me, right? So I happily handed over my €14.99 and couldn't wait to have a play at home. The packaging is lovely, the palette itself is thin and light and perfect for bringing away. The mirror is only huge! It takes up the whole top lid space which I love. There's a great selection of wearable colours and some mad ones too for the braver make up lovers. I spent this afternoon in swatch land, taking advantage of daylight so scroll and take a look at swatches of all 22 colours. The shade on the right below is fab and looks like a mix between MAC's Sketch and Shale. 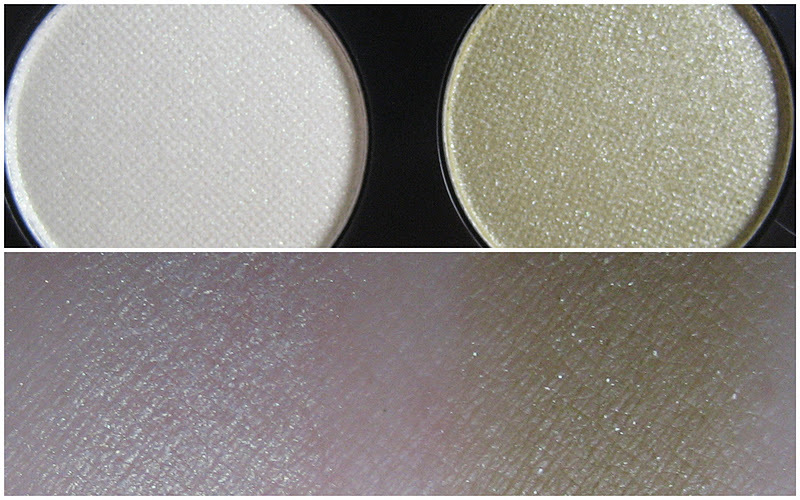 The other two aren't great pigmentation wise but would be useful for blending. I was really disappointed with the midnight blue shade in the middle below. 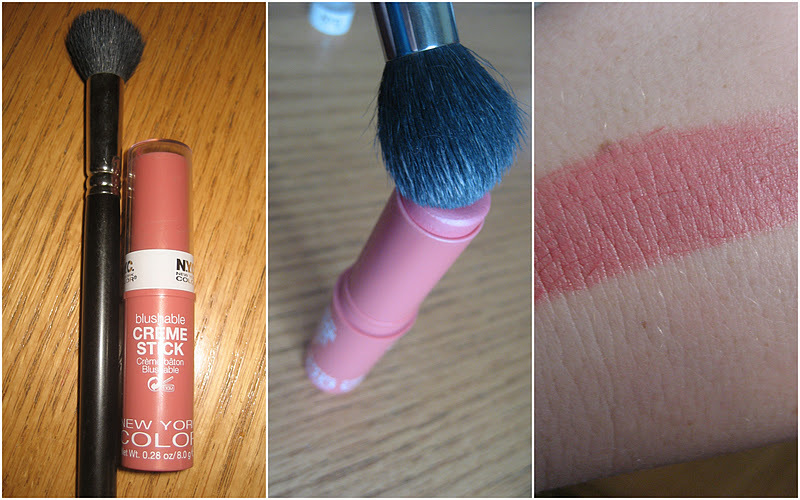 It wasn't very pigmented at all but I'll give it a go over a base or even wet. 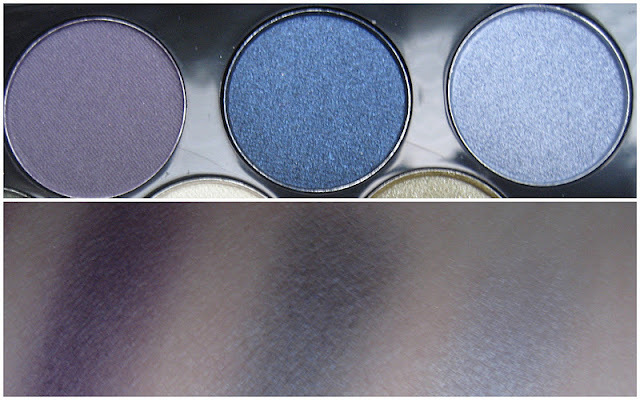 I'm obsessed with midnight blue eye shadows and am not letting this go just yet. 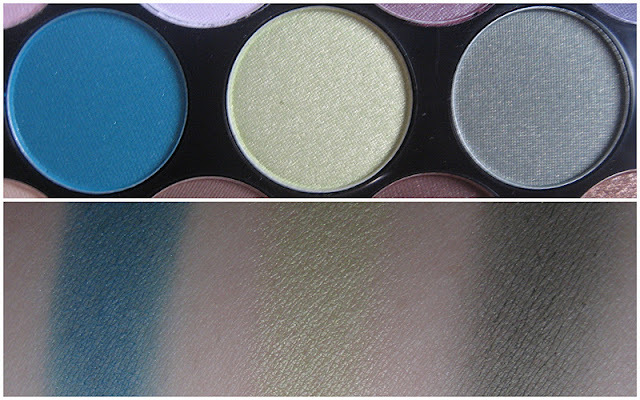 The teal colour below right is so gorgeous and pigmented. 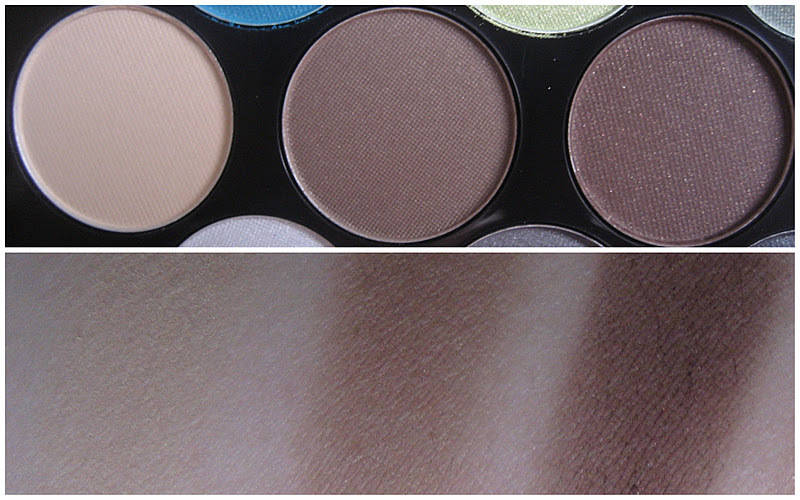 I actually love all three of these shades, in particular the olive shade on the right. Loving the pearly white shade on the left for an inner corner highlight. We're into the more Autumnal and neutral shades. The colour on the right is absolutely beautiful and I can't wait to play with it. 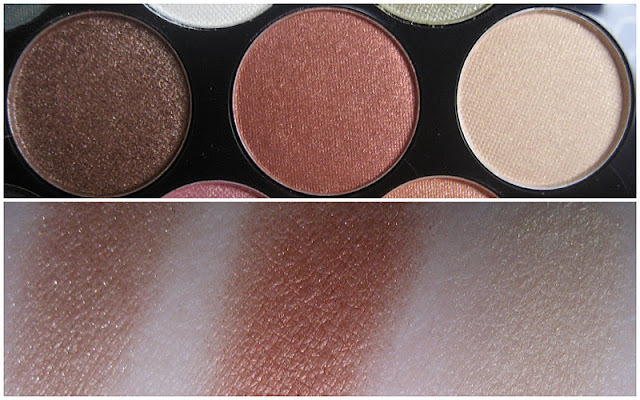 The copper shade in the middle is one of my faves from the palette, it's so pigmented and is reminiscent of MAC's Antiqued. The silver and black shades are next. I didn't find them great to be honest, especially the darkest one on the right, I had to work hard to get it to show up on my arm. I love the shimmery white one on the left though. 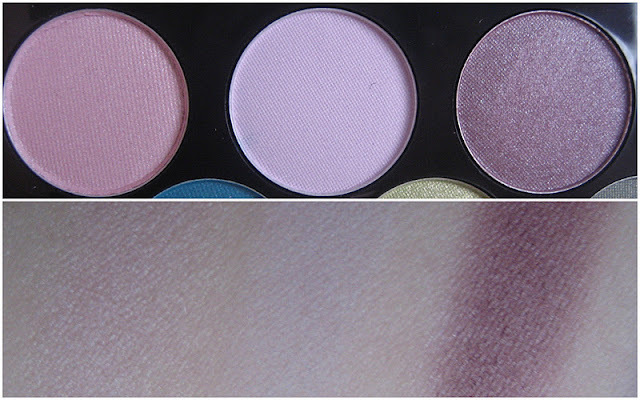 Finally are the most random shades of the palette, a pink and coraly orangey one. I couldn't see them going on my eyelids to be honest, but I might give them a go on my cheeks and see what they're like. So folks, is this something you'd be interested in? I think it'd make a great Secret Santa present and for €14.99, it's great value altogether! It's available in A Wear shops and selected chemists so keep an eye out ladies and let me know if you pick one up! Right now we have a Facebook only giveaway here where we're giving away some Christmas goodies from Lush so head over there to enter that! Now, we couldn't leave our lovely blog followers out of the Lush goodness so we're going to give away these prizes to one lucky follower! We have a Golden Wonder Bath Ballistic, a Rockateer Bath Ballistic and a Magic Wand bubble bar up for grabs, so read the rules below and get cracking! 3. For your third and final entry, tweet the following message "@Lovelygirlybits is giving away Lush Christmas goodies! http://alturl.com/zm6kx #lushgiveaway"
The giveaway is open internationally. It will close at midnight GMT on 30th November 2011 and we will use Random.org to pick the winner. We will contact the winner to get their postal address. Please allow 28 days for delivery. If you want to enter our Facebook only Lush giveaway, get your bum over here and follow the instructions! Just over a month ago, I went to the award winning Nu Essence Salon in Dublin to try out their new treatment called MYlash. Read about it all here because ain't no point in me repeating myself! Anyways, I promised a full and frank update, so four weeks later, how did I get on? I will admit, I had the fear that as the treatment wore off, I'd be eyelashless but figured, sure if all comes to all, I'll use fake eyelashes until they grow back. I've done a photo collage of before treatment, right after treatment and now. Have a looksee. 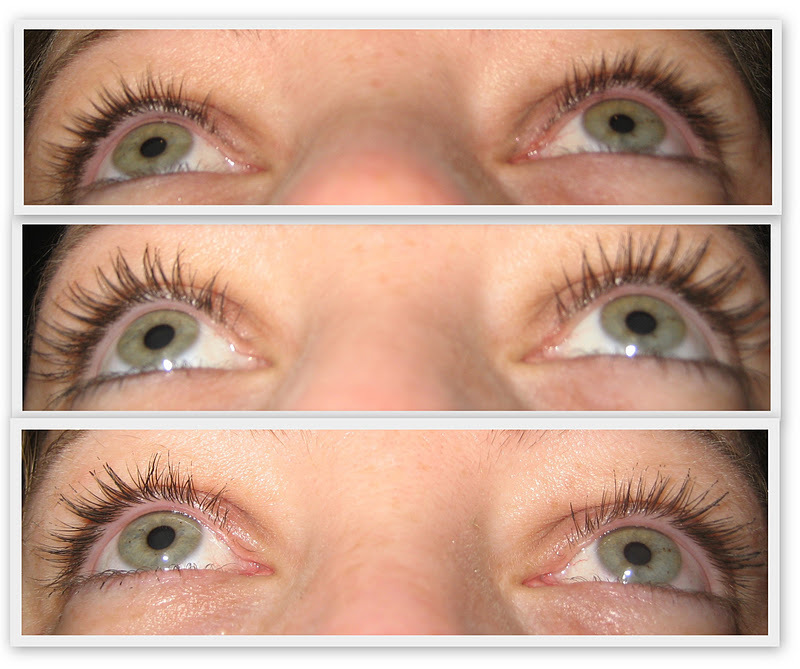 There is still some of the MYlash on my eyelashes, mostly at the roots and at the very tips. I can't tell that by looking at it in the mirror, just from my up close and personal photos and by the feeling when I put mascara on. When I'm applying my usual mascara (Benefit's They're Real), it just feels like there's already a light coat of mascara already on and I'm applying a second coat. You can see in the side-on photos below that there's still a bit of curl left in my lashes. I don't curl them in day to day life as it is and was surprised that the curl lasted so long. You can still see the MYscara slightly in the top and bottom lashes but of course it has faded. 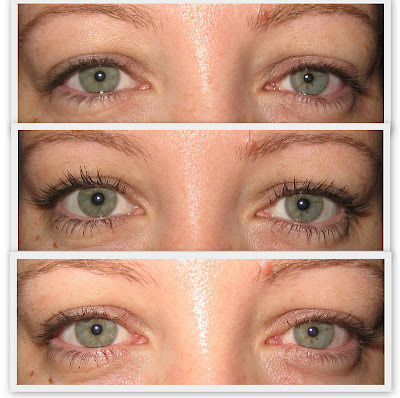 The photos below show the thickness of my eyelashes, before, during and after. Margaret from Nu Essence explained that I might lose some lashes as the MYscara came off an eyelash that was attached to another one, so I was scared I'd be baldy lashed. I only lost 6 eyelashes in total. I know that's sad that I counted them, but I wanted to be able to tell you! I started losing them about 10 days ago, so 2.5 weeks into the treatment as I was applying mascara. I was combing the wand through my top lashes and I could see the tip of a lash that had fallen out stuck to the tip of another eyelash, so a quick yoink got it out and that was the extent of my eyelash loss. The first two mornings after getting the MYscara done, I woke up to a few of my eyelashes tangled together, but I used the end of a tweezers to unstick them. It felt very strange altogether to be able to rub my eyes without the fear of having panda eyes! It's vital to use an oil free eye make up remover when removing make up, so I bit the bullet and repurchased Simple's eye make up remover and thankfully didn't have any pink eye reaction. The feeling of taking your eyeshadow off but not the mascara is a strange one I tell you that! So ladies, would I recommend to a friend? Most definitely and I will be getting this done again without a doubt. It was great if I was in a rush legging it out the door to work to only have to do my foundation, blush and powder, ready to go in 3 minutes and no poking myself in the eye in my haste to perfect my lashes! Joanne (the one who doesn't wear much make up) was really surprised with how natural it looked and so were the girls at work. I think we were all expecting I'd come home with Miss Piggy lashes, causing a gale force wind at every blink. But thankfully I just looked like I had mascara on, which was the whole point of the treatment! As I explained in my initial post, I got two coats of the MYscara treatment done, but for the Christmas season, I'd go for three and you'd still be able to get away with that at work as well. So folks, is this something you'd consider trying? Head over to the Nu Essence Facebook page for more updates and prices, they've great offers going on at the moment in the run up to Christmas! Avon's New Beauty and Empowerment Ambassador!